If you haven't cottoned on by now by my countless posts about it, I bloody love brunch. 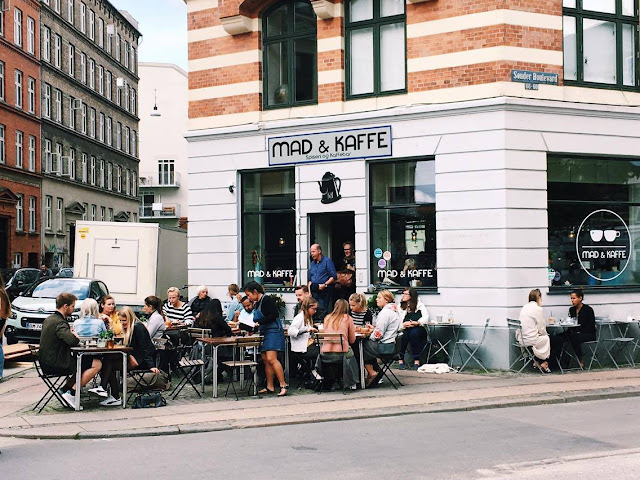 So when I was preparing for my trip to Copenhagen and was reading other blogs about where to go and what to see, I was pretty damn excited to see a few posts about Mad & Kaffe. If that many people were posting about it then surely it has to be good? Well, I am here to today to confirm that it is FAB. We actually lived a 30 minute bus ride from the restaurant as we were staying in an airbnb on the other side of town. Every post I had read urged you to get there early, and well, after a late night before we didn't actually arrive till 10am. It took us an hour to be seated. We were just handed a menu that we could cross of our choices on and then asked to wait on the other side of the street where there was one single bench and a few large stones you could sit on. Not exactly the perfect waiting scenario, however when we were actually seated we never felt rushed or that we were taking too long which definitely made up for it. 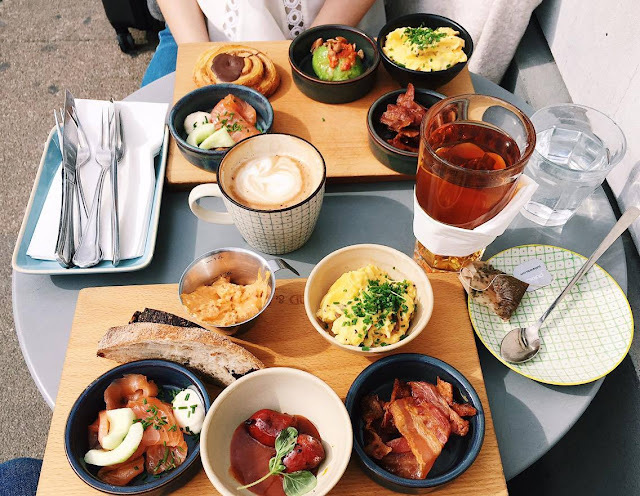 The main idea is that you pick the elements of brunch which are your favourite and then build your own meal. Choices ranged from blueberries and yoghurt, fruits, breads and cheeses and they even had a "treat of the day" section with a couple of pastries and buns. W and I decided to get five items each, which was 120 Kroner each, so roughly £15. Damn the falling pound. However, I have to say it was one of the few times that I've had brunch and then not been hungry again till the evening so it was definitely worth the price. Scrambled eggs with chives and mushrooms: Nice and creamy scrambled eggs with a lovely subtle taste of mushrooms. For me, eggs are the cornerstone of a good brunch so I would definitely recommend crossing these off your checklist. 1/2 Avocado with chilli oil and baked almonds: Fulfilling the millennial stereotype and ordering avocado, the chilli oil was delicious and the perfect accompaniment and the baked almonds added a lovely crunch and a different texture. Fried bacon: Just wow. We weren't expecting much when we ordered bacon as us Brits are pretty particular about how we like it, however it was absolutely delicious! Crispy enough that it was still juicy and flavoursome, but not too chewy. I would 1000% get the bacon again. Smoked Salmon with cream cheese mayo: I couldn't decide between about 5 other options and eventually went for the smoked salmon and I am so glad I did. The salmon itself was beautiful, melt-in-your-mouth deliciousness and the mayo had a hint of smokiness and cheesiness so was the perfect accompaniment. Organic cinnamon bun: You can't go to Denmark and not try a pastry so I opted for the cinnamon bun as a desert item. 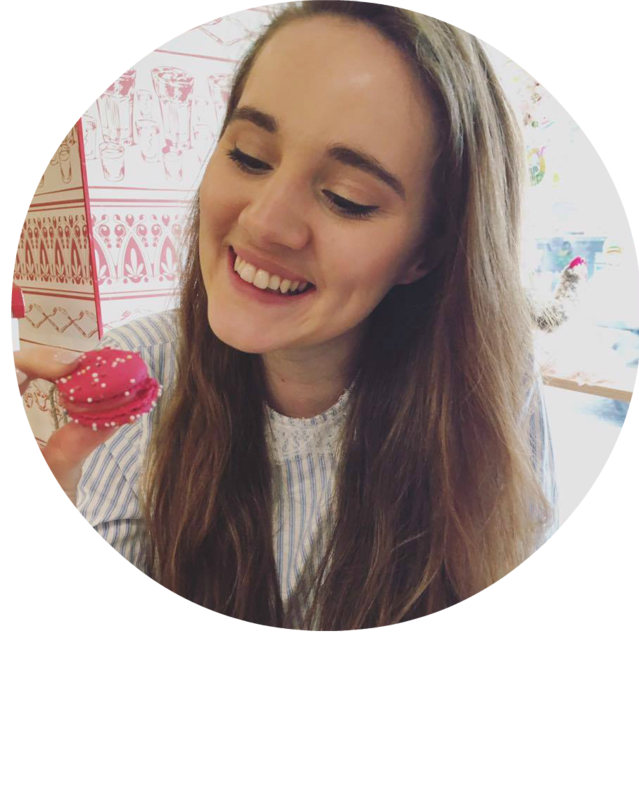 Cinnamon as a flavouring is pretty hit or miss with me, if it's too strong or bitter I just cannot eat it. It's one of those flavours which I think I am growing into as an adult as I never used to like even a hint of cinnamon at all! The bun itself was sticky and sweet, chocolatey and just the right amount of cinnamon. Yum. W had the salmon, bacon and eggs but swapped the bun and avocado for fried chorizo sausages with homemade BBQ ketchup and homemade cream cheese with sourdough bread and he really enjoyed both of them. Mad & Kaffe is one of the top rated restaurants in Copenhagen and it really isn't hard to see why. Yes, the queues are a bit ridiculous (there were probably about 20-30 people queuing for a table the whole time we were there) but you can really taste the quality of the food and I think it's a really fun concept! You have to choose whether or not to sit outside or inside when you arrive, as there are separate waiting lists for both. We sat outside, however next time I would probably opt to sit inside as the interiors were super cute and cosy and I think the queue actually moved a little faster. There will be lots more Copenhagen related content coming up on the blog as I took so many pictures and we managed to see quite a lot in the four days we were there! Let me know in the comments if you have ever been to Mad & Kaffe and if not, what your favourite brunch item is! This looks like the dreamiest of brunches, WANT! The fried bacon in particular looks delish. 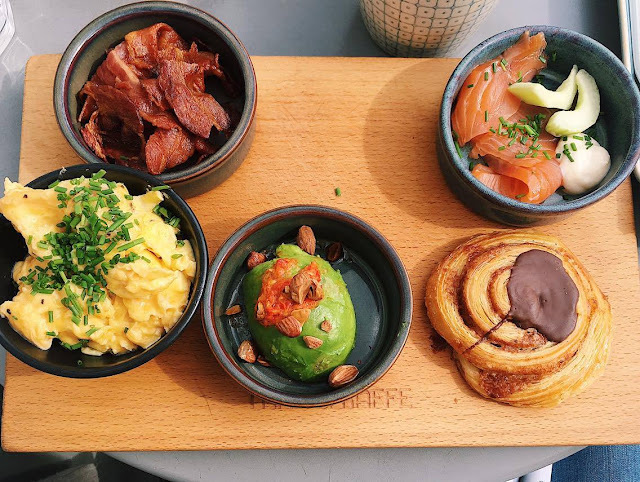 The brunch looks delicious !